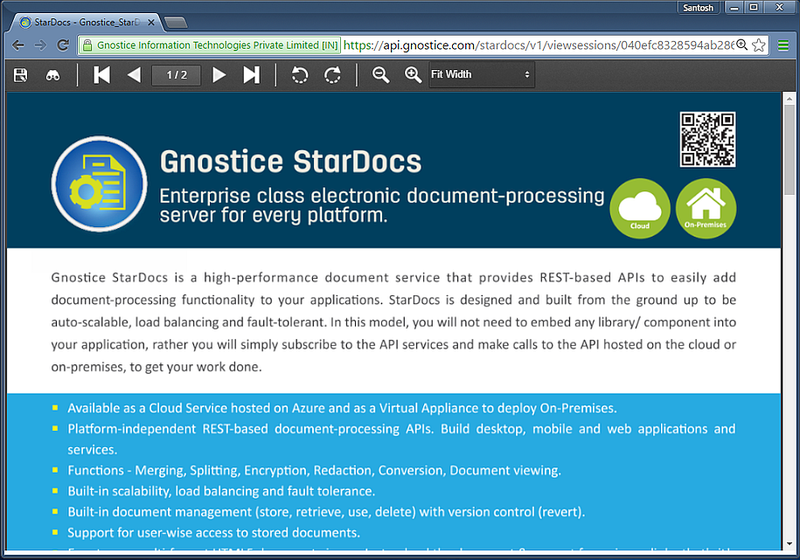 We are pleased to introduce Gnostice StarDocs Cloud and On-Premises APIs, our multi-format document processing and viewing APIs available on the cloud and as an on-premises solution. Gnostice StarDocs is a high-performance document service that provides REST-based APIs to easily add document-processing functionality to your applications. StarDocs is designed and built from the ground up to be auto-scalable, load balancing and fault-tolerant. In this model, you will not need to embed any library/component into your application, rather you will simply subscribe to the API services and make calls to the API hosted on the cloud or on-premises, to get your work done. You can use StarDocs right away in your application by signing up for a free trial. We also have a live demo hosted that you can try out. We have listed below a few articles which will help you get started with solving your document-related problems using StarDocs. Merging PDF files in your web apps using Web APIs - coming soon! Document conversion in your web apps using Web APIs - coming soon!